You can't go out to the best party in town every night, can you? Click here to play! Well, in the Ladies Nite slots, you can do it every night, all night if you like! Grab a bright cocktail, hit the dancefloor and writhe under the disco ball and let your hair down in this fabulous slots game. Can you seduce the shirtless waiters serving drinks at this exclusive club? Do you have the charm and the wit? 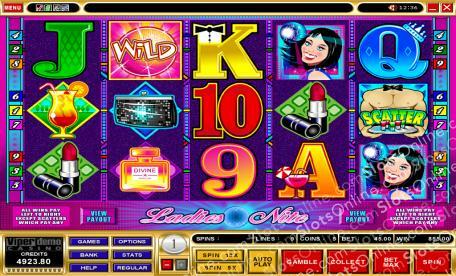 Or do you have the outright luck to win the jackpot on this slots game and buy yourself a toy boy? You'll have to have a Ladies Nite in on this slots game to find out. The Shirtless Waiter symbol is the scatter in this game, awarding 15 free spins at triple the usual payout when 3 or more symbols land on the reels. The Wild Disco Ball symbol substitutes for any symbol other than the scatter symbol. It also doubles the win of any payline it substitutes in. There is a gamble bonus game that allows the player to gamble a win on the main game. The player guesses the color of a playing card, or the suit of the card. A correct guess of color doubles the stake, while a correct guess of suit quadruples the stake. An incorrect guess loses the stake entirely. Autoplay can be set for up to 500 spins. It may also be set to stop when a jackpot is won, the free spins are triggered, on any win, on a win of a certain amount, or if credits increase or decrease by a certain amount.